Converting your email from Thunderbird to Outlook? Unless you’ve found a converter you can trust, you’re faced with a challenge. ​And here’s the worst of it: You know if you make the wrong decision, you could end up wasting hours of your precious time and still lose valuable email data. No data is lost in conversion. 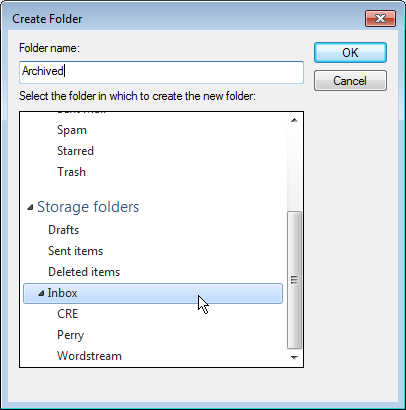 It automatically restores your mailbox folder tree in Outlook without any manual intervention. 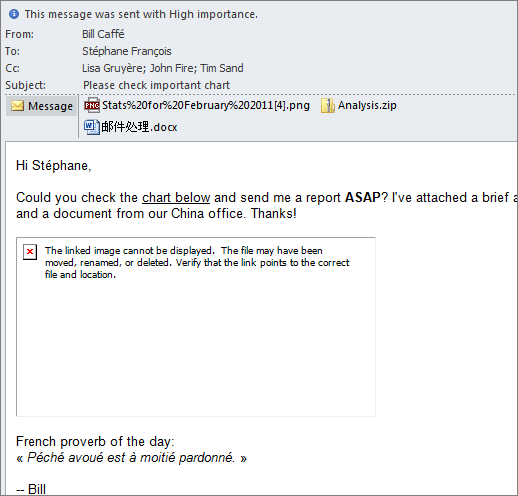 It correctly transfers the status information of your emails (like unread, replied, forwarded, and flagged) to Outlook. Still Want to Convert the Free Way? This method is a lot more complicated and time consuming. But it’s by far the best free solution on the Internet. It requires four programs: our free MBOX Converter, Windows Explorer, Windows Live Mail (WLM) and Office Outlook. Start by installing Aid4Mail MBOX Converter and Windows Live Mail if you haven’t already got them on your computer. You’ll need to download Windows Essentials to install WLM. First, convert your Thunderbird files to EML with Aid4Mail MBOX Converter. Click the Choose Source Files tab and select Thunderbird from the list. 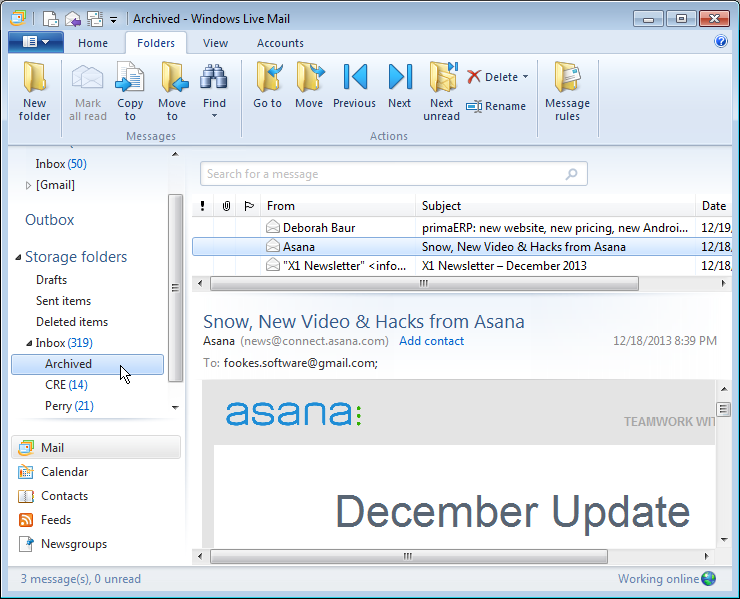 Next add the root folder of your mailboxes to the list by clicking on the Add Folder button. Click the Set Target Options tab or the Next button. Next select the EML files option near the top of the list. Confirm or change the target folder name. Click the Start Conversion tab or the Next button. Then click the Start button. Close Aid4Mail MBOX Converter once your mailboxes have converted to EML files. 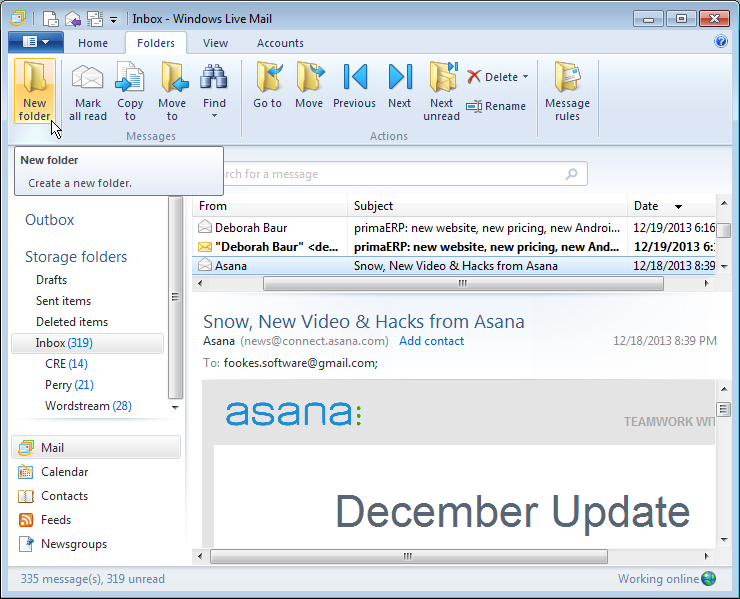 Open the Windows Live Mail program. 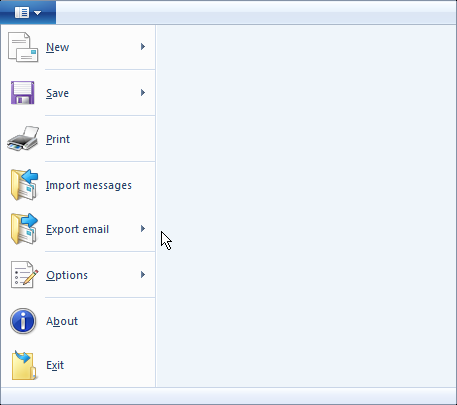 Select the Folders tab and click on the New folder icon to open the Create Folder dialog box. Type a folder name, select the folder in which it should be created, then click OK. If you have multiple folders with EML files, repeat step 2 until you’ve recreated the folder structure of your source EML messages. 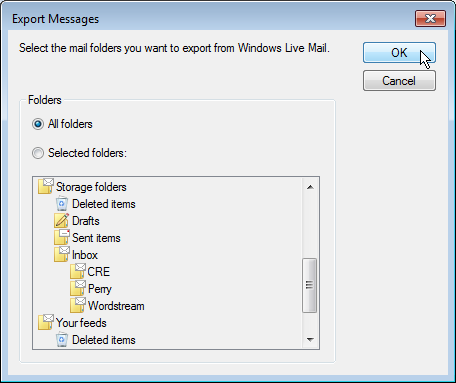 Select the target folder for your EML files in Windows Live Mail. 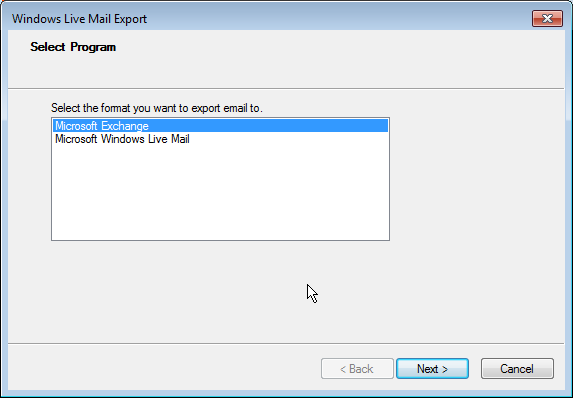 Select your EML files in Windows Explorer and then drag-and-drop them into the email list panel in Windows Live Mail. Repeat steps 4 and 5 for every matching source folder containing your EML files. When you’re done, the contents of your target folders will match those of your source folders. 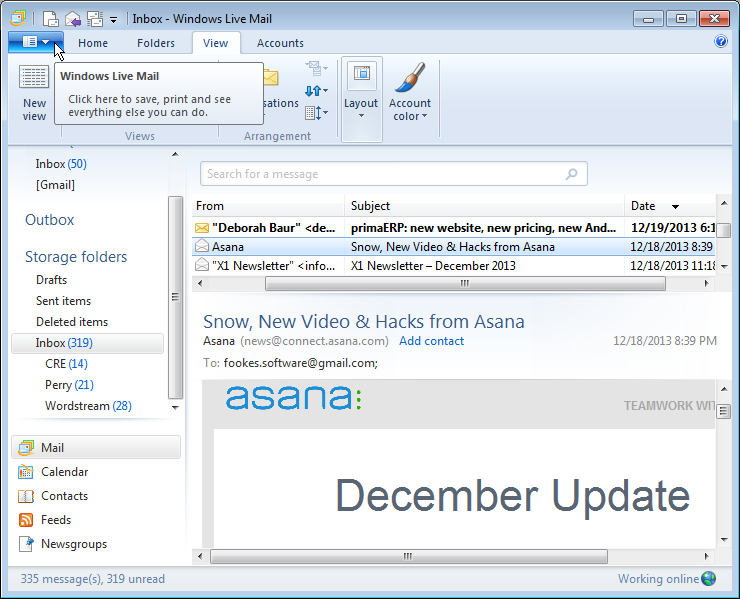 Now click on the dark blue tab with the “down” icon in Windows Live Mail. Point to Export email in the drop-down menu, and then click Email messages. 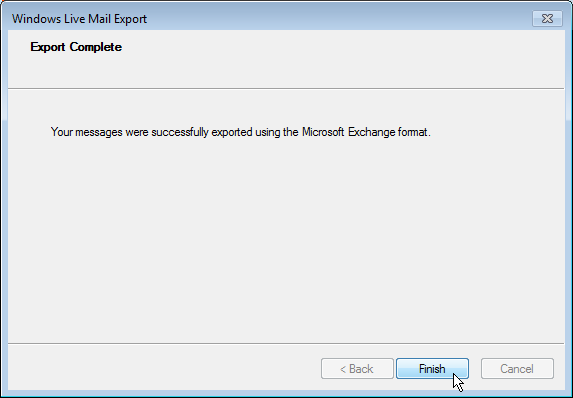 In the Windows Live Mail Export wizard, click Microsoft Exchange and then click Next. Choose your target profile name in the Choose Profile dialog box, and then click OK.
Click All folders to import all your messages, and then click OK. Or, click Selected folders, choose the folders that you want to export, and then click OK.
Click Finish when the Export Complete screen appears. You should now see your mailbox folders and emails under Imported Folder in Outlook. 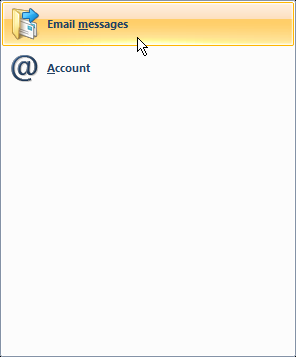 As you can see, exporting Thunderbird to Outlook without a professional conversion tool can be a cumbersome process. Sadly, it isn’t always accurate either. In conversions using this free method, email contents can get lost. See below for details. When it comes to email conversion tools, you typically get what you pay for. While you may still choose the free method, you need to be aware of your potential risks. Loss of SMTP headers. Using the free method, your emails will lose their original email SMTP headers (the top part of the email, where email addresses, subject and time stamps, and encoding marks are located). If you value the integrity of your messages, especially if you work in the field of computer forensics, this is a serious problem. Time consuming. If you have many accounts to migrate, transferring your emails manually will take a lot of time and energy. Note that it’s not Aid4Mail MBOX Converter causing these issues. 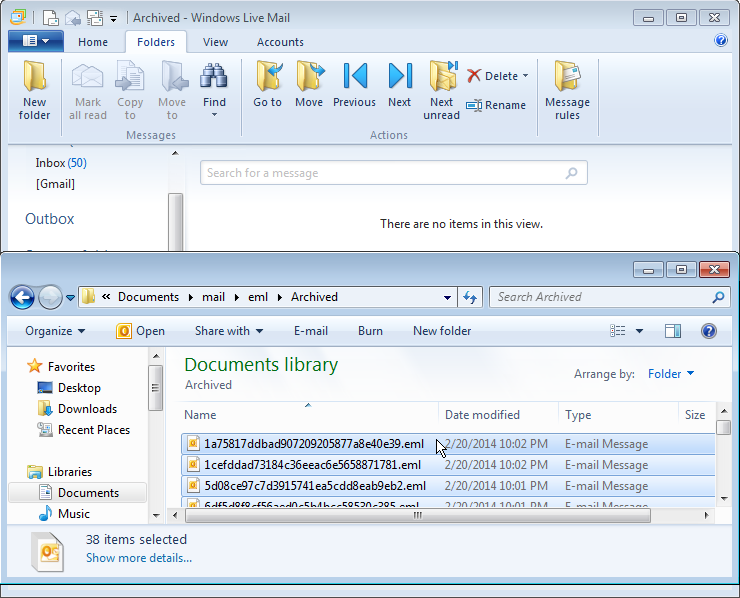 The loss of email data happens between Windows Live Mail and Outlook. It’s true. “Free” may initially appear to be a cost savings, but when you factor in the hours it takes to migrate your emails—and the low-quality outcome—you may actually save money using a commercial tool. Aid4Mail’s commercial version is unmatched in its accuracy and preserves more information during conversion than any of its competitors, both free and commercial. And with its user-friendly wizard interface, you can easily configure the export task step-by-step (see our tutorial on how to export emails from Thunderbird to Outlook with Aid4Mail). No doubt, like our clients, you’ll prefer the simple solution over this free method. The Aid4Mail Console Launcher is a new utility to assist with large-scale email migrations. Opt-in to receive email notifications about the progress of your migration. You’ll be notified if an account fails to migrate, and when all your accounts have been successfully migrated. ​Watch our video demo to see how easy email migration will be. Over 100,000 people have used Aid4Mail to quickly and easily migrate their mail. Be sure to install Outlook before you begin migration. Go ahead, take it for a test run and see for yourself how easy it is to use. We want you to be confident that Aid4Mail is fully compatible with your computer and does what you need. 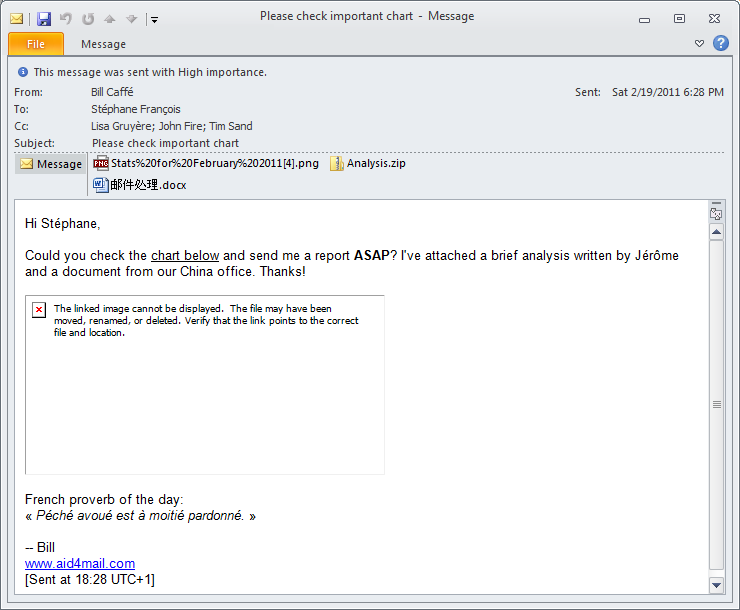 Download the trial version of Aid4Mail now.